New Millennium Studios is Virginia's first full-service movie studio. Situated in Petersburg Virginia, this sixty-acre facility is only thirty minutes away from the State's Capital. With a 14,850 square foot soundstage and post-production facilities that combine state-of-the-art digital technology with years of engineering experience -- New Millennium Studios provides support that other production studios can't match. Following the success of the critically acclaimed magazine...AMERICAN LEGACY TELEVISION will raise the bar of traditional programming for people of color. You'll discover fascinating and provocative tales, accomplishments, tragedies and the greatness behind some of the most unique African-Americans ever to strut the stafe of American History. Episodes will offer a new, informed perspective of people and events that mainstream history has, up until now, avoided. You'll also meet African-Americans who changed the outcome of world wars, settled the west, fueled scientific discoveries, helped map the globe, and played an essential role in shaping the destiny of mankind. History will never be the same!" Paula is an ambitious, intelligent young business woman who makes the worst career move ever... she falls in love with her boss, Michael. His wife, who actually owns the company, discovers the betrayal. Paula loses her job and is shunned by her sister and her colleagues. Michael does what any man with everything to lose would do... he deserts her. Humiliated, in a fit of passionate anger, Paula shoots Michael. A scintillating murder trial ends with a light sentence and Paula discovers that nothing is what it appears to be. Mississippi, 1963. Essie Lee Lane is a small-town girl from a humble background -- and proud of it. Dedicated to her loving family and her church, she doesn't take "stuff" from nobody. Not from the rowdy customers at her job at one of Mississippi's best rib joints, and certainly not from the visiting preachers who often behave as if they are God's gift to the world. Yet Essie Lee isn't ready for the Reverand Theophilus Simmons, the new and very eligible pastor of Memphis 's Greater Hope Church. Down-to-earth, caring, romantic, and oh-so-fine, he is one of the most respected young preachers in the African-American church during this time of vast social change. He's everything Essie thought she'd never find, a man who loves God, repects her for her straight-talking ways -- and who ignites her with a divine fire all his own. And Theophilus realizes that Essie has everything a pastor needs in a wife -- a First Lady with compassion and brains who will share the joys and challenges of his minstry. But soon Essi and Theophilus discover that dealing the Greater Hope congregation won't be any honey moon even after they're married. With their parishioners in turmoil and their denomination facing a major scandal, Essie and Theophilus find their marriage and their church put to the test over and over again... as they struggle to lead the CHURCH FOLK to harmony and to God's sweetest rewards. At first glance, it seemed that Chance, Lauren, and Michael had it all. 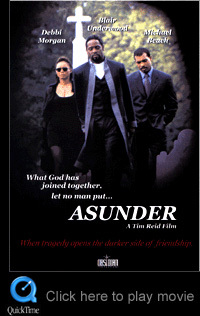 But a tragedy opens up the darker side of friendship when Chance's wife is killed in a freak accident. Jealousy replaces mourning as Chance blames Michael for his loss, and seduction is his weapon to exact revenge. Lauren and Michael's lives become a nightmare as Chance slowly descends into madness. Blair Underwood (City of Angels, Deep Impact), Debbi Morgan (Eve's Bayou) and Michael Beach (Soul Food, Third Watch) are caught up in this powerful thiller of revenge and obsession. An edgy adult comedy set in a popular Washington DC bar where the customers range from politicians to cab drivers and the topic of coversation can go anywhere. Fresh and abrasive, LINC'S won the acclaim of many national critics and ran for two seasons on Showtime. Featuring an ensemble cast that includes Steven Williams (The X Files), Pam Grier (Jackie Brown), Golden Brooks, Georg Stanford Brown, Joe Inscoe, Daphne Maxwell Reid (Fresh Prince of Bel Air), Adewale Akinnouye-Agbaje (Oz), Tisha Campbell and more. Now in reruns on BET. Experience an America that remains only in the hearts and minds of those who were brought up in this small southern community. Lost in the sweat of the cotton fields and hidden in the juke joints of Muddy Water blues, the people of Glen Allan nurtured and protected each other while celebrating life to the fullest. Based on the critically acclaimed book by Clifton L. Taulbert, ONCE UPON A TIME... 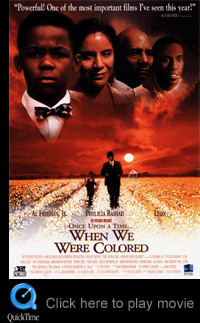 WHEN WE WERE COLORED chronicles the aurthor's coming-of-age in the segregated South in a time when the Ku Klux Klan terrorized the streets and "White's Only" were among the first words learned by African American children. Clifton was encouraged by the love and kinship of the tightly knit community to overcome the bigotry and intolerance of the South, allowing him to embark on an extraordinary journey. important films I've seen this year!" 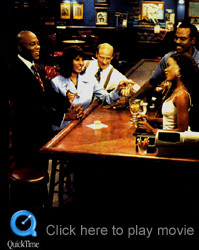 FRANK'S PLACE, an exceptionally innovative half-hour television program sometimes referred to as a "dramedy," aired on CBS during the 1987-88 television season. The program won extensive critical praise for the ways in which it used conventions of situation comedy to explore serious subject matter. As Rolling Stone writer Mark Christensen commented "rarely has a prime-time show attempted to capture so accurately a particular American subculture--in this case that of blue-collar blacks in Louisiana." In 1987 Frank's Place won the Television Critics Association's award for outstanding comedy series. In 1988 one episode, "The Bridge," won Emmy awards for best writing in a comedy series (writer and co-executive producer, Hugh Wilson) and outstanding guest performance in a comedy series (Beah Richards). 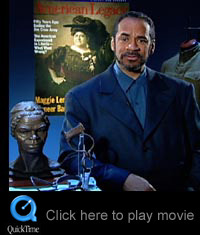 Tim Reid, star and co-executive producer, received an NAACP Image Award. In spite of its critical success, the show ran for only one season on CBS.